OpenComRTOS has a long history behind it supporting heterogeneous embedded systems in a transparent way going back to 1991. At that time processors were discrete components connected using communication links. Today such architectures are commonly integrated onto a single SoC (System on a chip). Heterogeneous cores are used to optimise performance and power consumption and tens of peripheral I/O blocks provide real-world connectivity. Programming such a system however is not so trivial as the target is complex. OpenComRTOS Designer™ makes that transparent as it is based on a formally developed programming model that separates the application logic from the target's topology. 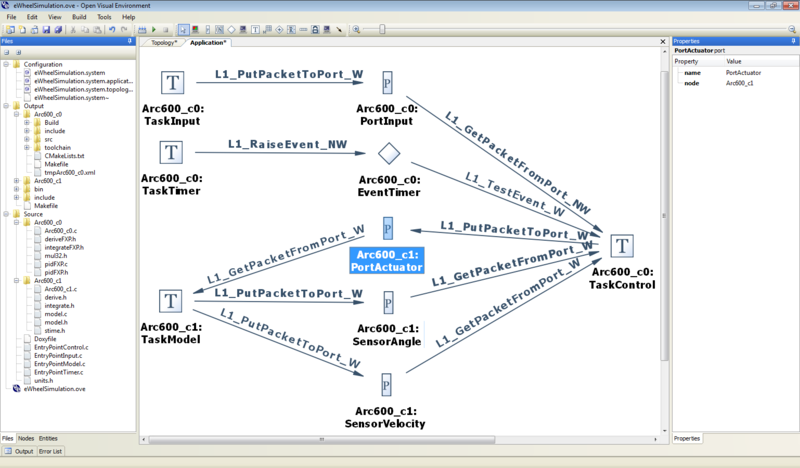 This is achieved by embedded the necessary interprocessor communication as a transparent service in the system layer. Hence the traditional middleware layers do no longer run on top of the operating system but are merged into the operating system layer. A major benefit of this approach and the formally developed architecture is a much reduced code size, typically only 10 KBytes/node. Another benefit for the application developer is that he can transparently move application code around by recompilation and access peripherals attached to other processing nodes. He can also cross-develop on his PC workstation. Depending on the services needed, the full kernel requires between 9 and 10 KBytes on the ARC600 (measured on the instruction set simulator, compiled with 0s), this includes the C-runtime library. A typical semaphore loop takes about 2490 cycles (which means 4 context switches and 4 kernel services). Interrupt latency is around 33 cycles to reach the interrupt handler, 103 cycles the reach the Interrupt Service Routine and 660 cycles to reach a waiting processing Task). Synopsys' DesignWare® ARC® 600 Family of 32-bit RISC processor cores are optimized for embedded applications and DSP tasks where high performance and low power consumption is required. To address a wide range of processing needs, the DesignWare ARC 600 family includes flexible memory options such as single-cycle Closely Coupled Memories (CCMs) for instructions and data, as well as configurable I-cache and D-cache. The DesignWare ARC 600 family offers a broad range of processor solutions that enable system-on-chip (SoC) designers to create a wide range of embedded microprocessors that are optimized for their specific target applications. These solutions include the DesignWare ARC 601, ARC 605, ARC 610D and ARC 625D.